Cryptic letters are codes for Japanese/Chinese characters. English readers may skip them. コンパクト・マグネチック・ループの理釈�鱚羹�邃遶竍薇豁纃瘟讚頏阡繝�闔�竚癈鷭∂焜聨纃瘟赧漓�癆甅竊纃瘟貊�宴繝陰詔纃瘟讀１彊諮鳫�笏繖歇�召伴尊檗��頁液療�ぢ昭�蓿繙就�粮�芍��轣蛹�鳫�笏蜿遐�赱齠就烝竊煥轣蛹烝�籬��聽轣蛹就抗矮箙羝粤甼粭箜⊂桿轣蛹Γ蔚飴頏阡繝�籟鹿畩、 HAM Journal 1994年 9・10月号 pp.49-72. 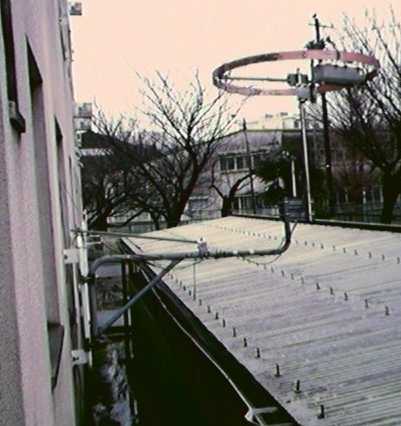 Transmitting Short Loop Antennas for the HF Bands, I1ARZ Roberto Craighero, Communications Quarterly 1993 Summer/Autumn, 訳 JA1AFT 平崎 宏、HAM Journal 1995年 7・8月号 pp.43-55. Small High Efficiency Loop Antennas for Transmitting, The ARRL ANTENNA BOOK 17th EDITION pp.(5-11)-(5-16). 6バンド・スモール・ループ・アンテナの室内実験、JA6HW 角居洋司、CQ Ham Radio 1994年10月号 pp.229-233. Although a magnetic loop antenna(aka small loop antenna) is very compact, its efficiency is close to a half-wavelength dipole if carefully built. The key point is to make the loop element with material of low ohmic resistance. Otherwise, ohmic loss in the element causes disappointingly low efficiency of the antenna. For the same reason, joints between elements or joints between an element and a tuning capacitor need be soldered or silver-soldered. Aluminum is rarely used for the elements because it cannot be soldered. Therefore, homebrewers often use thick rigid copper water pipe with, for example, 1/2" to 2" diameter. However, I built my own small loop antenna with strips of printed circuit board stock. They are fairly lighter, much easier to solder and cheaper than the copper pipe. Copper foil of the PCB is very thin. Therefore, one might think that the resistance is much higher than the copper water pipe. However, you should remember so called "skin effect" of HF current. HF current tends to flow only in the thin surface region of the conducting material. So the thin foil does not necessarily cause more ohmic loss than thick conductor like copper tube. The deep region of the conductor has almost nothing to do with the conduction of HF current. Thin conductor with large surface area may work even better. The skin effect is characterized by a quantity called the "skin depth". The HF current at the skin depth below the surface of the conductor is 1/e (= 1/2.718) times the current flowing on the surface. The skin depth of copper is about 21 microns at 10 MHz. Very thin. The skin depth decreases as the inverse of the square root of the frequency. If the copper foil is a few times thicker than the skin depth, it is practically thick enough for the HF current of the specified frequency. I got ten strips of surplus PCB stock with copper foil on both sides at a price of 200 yen(approximately US $2) at a surplus shop in Tokyo. Each strip is about 40 cm long and 7 cm wide. The copper foil is about 50 microns thick. The copper foil thickness devided by the skin depth is 50/21, about 2.4. I would, therefore, say the thickness of 50 microns is practically OK for 10 MHz or higher frequencies. Seven strips of PCB are connected together to form about 270 cm-long and 7 cm-wide strip, and curved into a circular loop of about 90cm diameter. Each joint between adjacent PCB strips is overlapped by about 2 cm. Each overlapping part is tightly connected with two screws. To make a good electric contact at the joint, self-adhesive copper tape is sticked and solderd on the boards on both sides of the joint. Connections between the element and the tuning capactor need be done using thick and wide copper leads, e.g. copper braid of coaxial cable. The contacts should be also soldered. Simple screw-fixing is not good because of the contact resistance, which would result in again a low efficiency. The rest of the construction is not much different from the ordinary small loop antennas. For the details of constructing small loop antennas, please refer to the reference articles listed below. REFERENCES Transmitting Short Loop Antennas for the HF Bands, I1ARZ Roberto Craighero, Communications Quarterly 1993 Summer/Autumn. Small High Efficiency Loop Antennas for Transmitting, The ARRL ANTENNA BOOK 17th EDITION pp. (5-11)-(5-16).